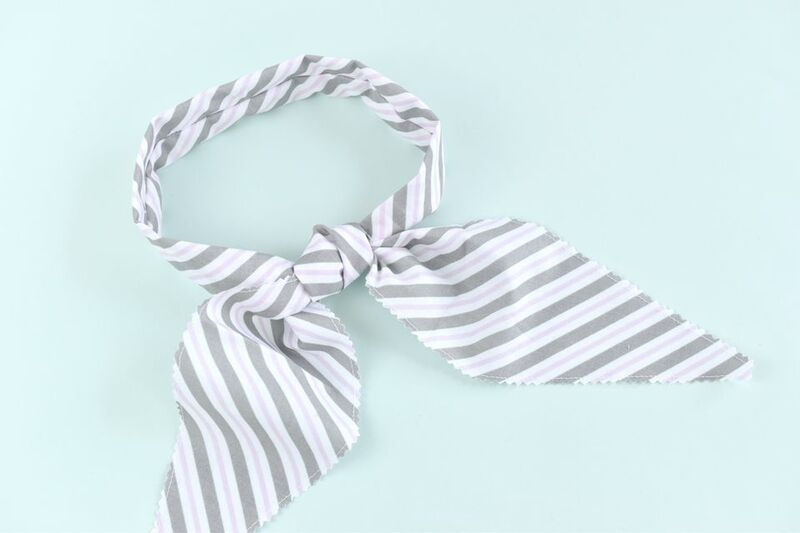 Stay cool this summer with a 50s style neck scarf! This easy tutorial shows you how to sew a simple scarf that retains water, keeping your neck cool. It's perfect for wearing to a picnic, sporting event, or parade on a hot day. The secret to this cooling scarf is a teaspoon of water-absorbent crystals. When soaked, this polymer grows and stays wet to the touch, keeping the fabric damp and you cool. If you're hosting an event in the summer heat, you might even want to sew and soak a bunch of these to offer to your guests! Note: These directions use Soil Vigor Granules. Amazon and some home and garden centers may carry some form of crystals in the gardening section. Just be sure to look for crystals that are large enough that they won't work their way out through the seams. Water beads would also work, but they will create a lumpier scarf. Use rotary cutting tools for fast and accurate cuts. Cut a strip of fabric to 4" wide by the width of the fabric. With the fabric folded, so the selvages match as it was on the bolt, mark 6" from the selvage on each long side. Mark the center of the selvage edge. Align your ruler from the 6" mark to the center of the selvage. Cut on these lines for a pointed end. Trim the point to remove a small amount of selvage. Sew a line of stitching around the entire scarf, sewing about 3/16" from the edge. Use pinking shears to trim the fabric without cutting the stitching. Almost any seam finish process can be used to finish the raw edge, including serging with a two or three thread flat-lock or rolled edge zig-zagging the raw edges. Your goal is to prevent the edges of the fabric from fraying with repeated use. Fold the scarf lengthwise with right sides together. Mark the center of the strip. Mark 8" from the center toward both ends. Pin the edges together. Sew a seam about 1/8" from the line of finishing stitching and along the long edge between the marks. Backstitch at the beginning and end. Use a small stitch length to prevent the crystals from leaking. Lay the seam to the center of the strip. Sew across the scarf at the end of one side seam. Be sure to backstitch to prevent the stitching from coming undone. Place about one teaspoon of "watering crystals" in the tube. Tap the crystals down to the opposite end of the tube. It doesn't seem like many crystals but they expand and fill the tube. Sew across the other end of the seam to close the tube, just as you did in the previous step. Place the scarf in cool water until the crystals are plump. Depending on the crystals you use, it may take 10 to 20 minutes for them to fully absorb water. Note: Test the number of crystals you are using and be sure to use quality thread. The brand and the amount of time they are left to soak can cause a difference in the amount of expansion of the crystals. With cheap thread and too many crystals, the seam may burst while soaking. How to Sew a Tissue Box Cover So it Always Matches your Decore!